[153 Pages Report] The video analytics market size is expected to grow from USD 2.77 Billion in 2017 to USD 8.55 Billion by 2023, at a Compound Annual Growth Rate (CAGR) of 21.5% during the forecast period. The base year considered for this study is 2017 and the forecast period is 2018–2023. With the increasing penetration of Internet of Things (IoT) and related technologies, such as big data and serverless architecture, the demand for video analytics solutions and services among enterprises is expected to grow significantly. The video analytics ecosystem comprises service providers, such Aventura (US), Genetec (US), IntelliVision (US), intuVision (US), PureTech Systems (US), Cisco Systems (US), Honeywell (US), IBM (US), Axis Communications (Europe), Agent Vi (US), AllGoVision (APAC), Avigilon (US), iOmniscient (APAC), BriefCam (US), Digital Barriers (Europe), Aimetis (US), 3VR (US), Ipsotek (Europe), Gorilla Technology (APAC), KiwiSecurity (Europe), Intelligent Security Systems (US), Verint (US), Viseum (Europe), DELOPT (APAC), i2V (APAC), and Qognify (US). The other stakeholders of the video analytics market include systems integrators, application designers and development service providers, and network service providers. The video analytics market is expected to grow from USD 3.23 Billion in 2018 to USD 8.55 Billion by 2023, at a Compound Annual Growth Rate (CAGR) of 21.5% during the forecast period. The demand for video analytics is expected to be driven by many factors, such as low costs, flexibility, agility, and security. Video analytics offers accelerated Time-to-Market (TTM) and enhanced operational processes. The video analytics market has been segmented on the basis of type, application, deployment mode, vertical, and region. The service type is expected to grow at a higher CAGR during the forecast period, and the software type is estimated to hold a larger market size in 2018 in the market. The adoption of video analytics software and services among enterprises has become a central part of the business process, due to the ease of use and the flexibility they offer, and is expected to grow in the coming years. The on-premises deployment is estimated to hold a larger market size in 2018. By using video analytics solutions, enterprises are developing newer and better ways of enhancing the operational benefits, while reducing the costs. Faster deployment, scalability, and agility; regulatory compliance requirements, need for reducing Capital Expenditure (CAPEX) and Operational Expenditure (OPEX), and uninterrupted business continuity are expected to drive the demand for video analytics solutions and services. Enterprises, which are adopting video analytics, are increasingly inclined toward deploying video management solutions to run their critical business functions. 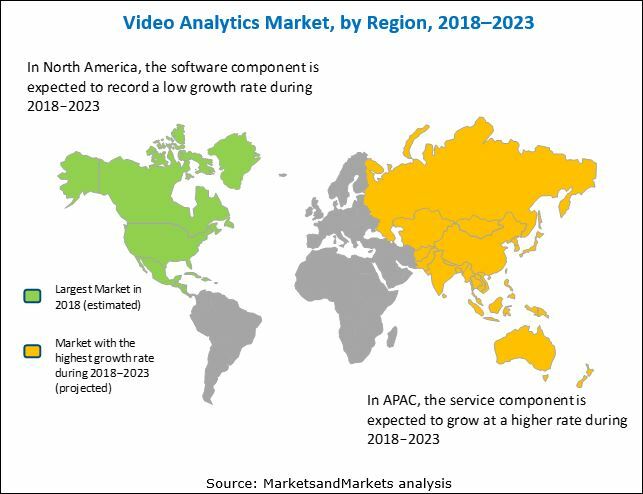 North America is estimated to hold the largest market size in 2018, whereas the Asia-Pacific (APAC) region is projected to grow at the highest CAGR in the video analytics market during the forecast period. An increasing need for efficient video surveillance and complete security while operating in physical, virtual, or cloud environments is expected to drive the global market. Disadvantages of manual video analysis, enterprises’ demand for actionable insights from video data, government investments in emerging technologies to enhance public safety infrastructure, and falling prices of video surveillance equipment are major growth factors for the market. However, demand for high investments in legacy installations and privacy issues could affect the growth of the market. The major players in the video analytics market are Aventura (US), Genetec (US), IntelliVision (US), intuVision (US), PureTech Systems (US), Cisco Systems (US), Honeywell (US), IBM (US), Axis Communications (Europe), Agent Vi (US), AllGoVision (APAC), Avigilon (US), iOmniscient (APAC), BriefCam (US), Digital Barriers (Europe), Aimetis (US), 3VR (US), Ipsotek (Europe), Gorilla Technology (APAC), KiwiSecurity (Europe), Intelligent Security Systems (US), Verint (US), Viseum (Europe), DELOPT (APAC), i2V (APAC), and Qognify (US). 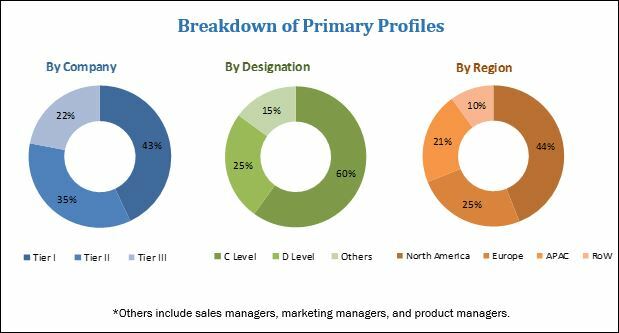 These players have adopted various growth strategies, such as new product developments, mergers and acquisitions, collaborations, and partnerships, to expand their presence in the global market.